Remember how I said fall would be all about the protective styles for me? Well I came across this style via a Youtube tutorial shared on KinkyCurlyCoilyMe.com and it seemed like a quick and easy style to do so I decided to try it out. Armed with my $4.99 Marley Hair, a scrunchie, some leave in conditioner, and a few mini-combs we took to the mirror and gave it a shot! The hair that I bought was (unbeknownst to me) a different kind of Marley hair than she uses in her video, so I wrapped the hair a little bit different than she did. This hair came in thinner strips so I tried wrapping it 4 strips at a time, building on the bun until it was the size that I wanted. I only used about 1/2-3/4 of the hair so it can definitely be built up bigger if you like! I could find my bobby pins (is it only me or do they disappear on everybody?) so I instead used two mini-combs to keep the back of my ponytail decent. I think it’ll transition into fall pretty nicely, especially with a scarf wrapped around it. 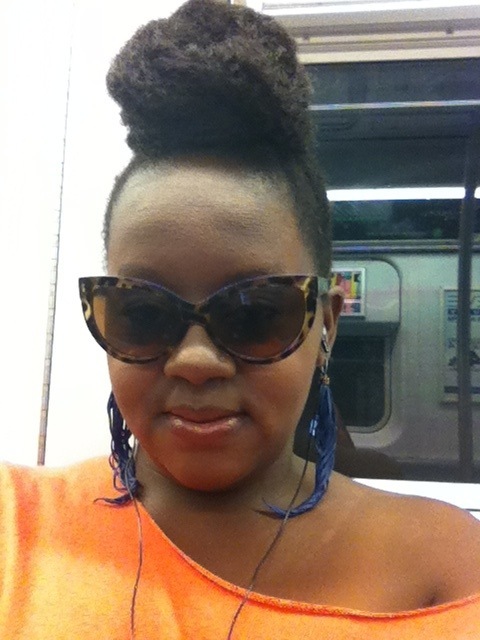 Yes I was taking pictures of myself on the train..Dont you judge me! It’s the perfect go-to style if, like me, you’ve ever decided to wash your hair in the morn and come to find out you don’t have time to really style it before you run out the house! Looks great on you Qui! I’ll need to try it one day. That’s my niece!!! I have been wearing my hair like this recently. It is a great protective style!!! Isn’t it awesome!? I love this style now that I know how to do it!